The unsung heroes in the long battle for justice for the victims of asbestos-related diseases are the grassroots organisations which took up the cause when no one else would listen. 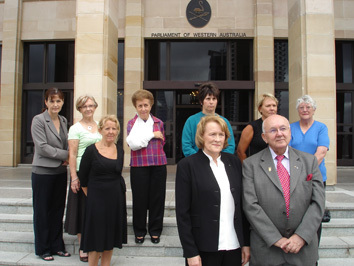 Each state organisation has worked as both a support group and a lobbying group for greater assistance and justice for victims.The first established and undoubtedly the strongest and most effective of these organisations is the Asbestos Diseases Society of WA (now the Asbestos Diseases Society of Australia). Western Australia became the first focal point because of the Wittenoom disaster and the special bond and continuing friendships among many former Wittenoom residents. Annual reunion picnics of the Ex-Wittenoom Residents’ Association were held from 1969 and as the toll of illness and death amongst the members rose, they provided support for one another.